The last few months were rather more Penguin themed than one might normally expect for a British summer, with Culture Uncle travelling half a world away to the Falkland Islands where, other than a whale skeleton and swathes of sand and snow, the majority of his pictures included a plethora of penguins in a variety of picturesque poses. Apparently they are also rather smelly, a fact that in no way seems to have deterred Mr Popper and his long suffering wife in a delightful new musical we were invited to sample at London's Cadogan Hall. Mr Popper is singleminded in his Polar obsessions. He reads everything he can get his hands on, delights in learning facts and corresponding with current pioneers of arctic exploration. Then one day his cosy home in an English backwater is turned upside down by the arrival of a new pet, a gift from one of his explorer contacts; a genuine penguin. He christens his new lodger Captain Cook, and proceeds to introduce his (semi) lead trained pet to the neighbourhood. This heartwarming story has a number of emotional twists and turns as his penguin gets sick - it transpires out of loneliness for his own kind... A mate and eight other miniature penguins follow and the Poppers find themselves letting the outside in to keep their brood as happy and at home as they can. Ultimately, the penguins must be occupied and find fame as a talented and spectacular attraction, before, as is always the case, the call of the wild finally beckons them home. 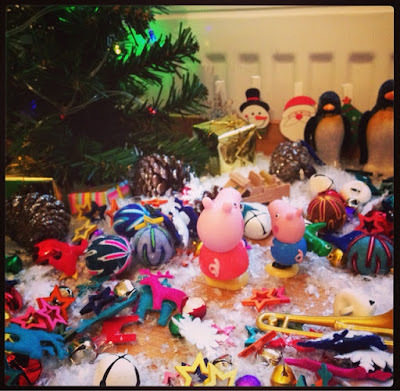 But what will Mr Popper do without his friends? The danger of a show aimed at younger children is that it either becomes pantomimesque (I'm afraid I'm not a fan) or overly simplistic. Happily Mr Popper's Penguins lapsed into neither of these. The story was engaging and fast moving yet intelligent (with real facts about the arctic), the songs were both fun and had good parts and harmonies, the penguins were brought to life by clever puppetry. There were sadder moments in the story when I could see the audience was visibly moved. 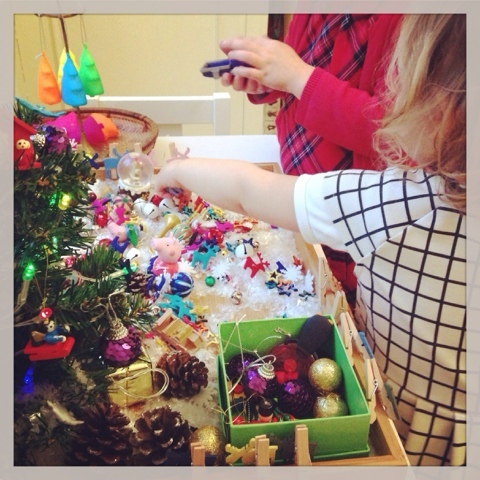 It was sweet, heartwarming and the children really enjoyed it (as did we). 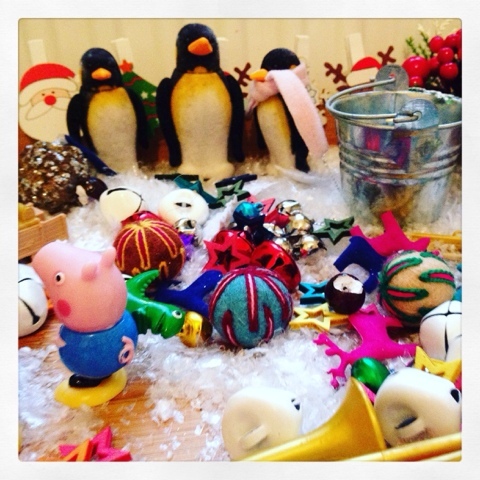 Culturebaby continued to sing the theme days after and talked about the show, so when I set up their seasonal Christmas play tray we included a family of penguins to play in the snow. 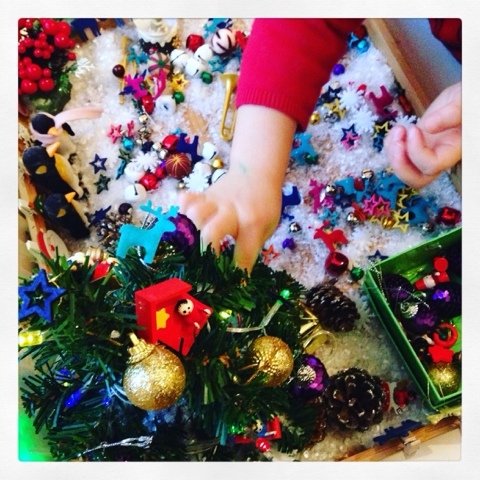 These scenes are so simple to create and effective for imaginative play. 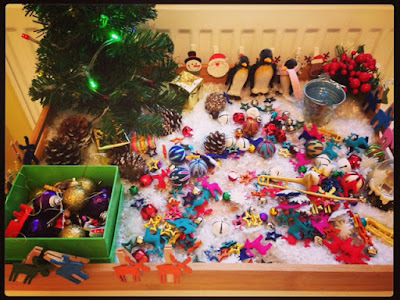 I include a small Christmas tree for them to dress with miniature decorations; wooden and felt snowflakes, stars, reindeer, bells, and other items to collect, count and sort; themed clips for fine motor practice and various characters and models to bring to life. We've also been re-acquainting ourselves with some of the loveliest Penguin themed literature in our collection. 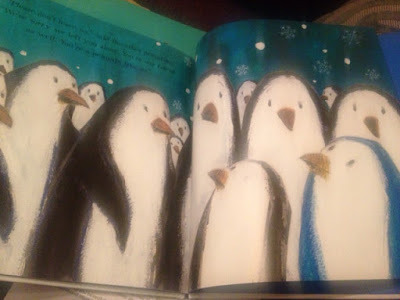 It appears that the titans of children's writing and illustration have also decided that the penguin shall be typecast as loyal and unusual companion and we have been reading a trio of heartstring-tugging tales of belonging and friendship. First - Polly Dunbar's Penguin, a simple yet profound tale about the importance of patience and effort in the labours of love. Ben receives a present of an unusual pet penguin and his efforts to engage and entertain seem to go entirely unrewarded; Penguin remains silent... that is until Ben lands in trouble and his companion finds a voice. Every effort was worthwhile, and none of it was forgotten. For parents, this adorable tale also speaks to the patience of waiting for a toddler to find their true voice, and the unparalleled joy of that first "I love you Mummy". Next, the classic Lost and Found from Oliver Jeffers. 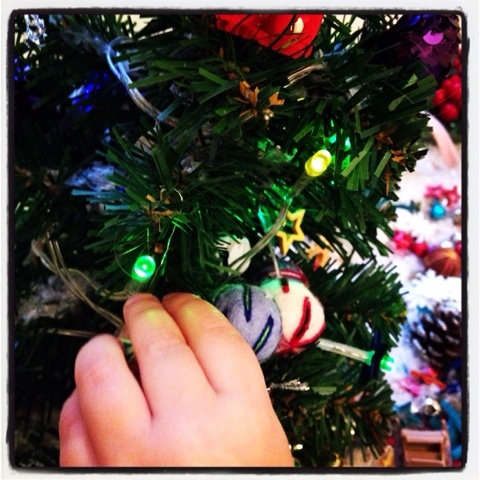 This time a boy finds a Penguin at his door, who looks sad and begins to follow him around. Unsure what else to do, the boy decides that the best solution is to return the little chap to his native South Pole. Together they voyage across land and sea; the boy tells stories and the penguin listens. Finally as they reach their destination and the boy deposits his charge, both realise that the true goal was the journey and their bond. Companionship was the solution all along and they return home united. Finally, one of our favourite author and illustrators, Petr Horacek, has produced a new and stunningly beautiful book Blue Penguin about the sadness, challenge and joy of finding a place to belong and the journey towards being both accepted and comfortable in ones own skin. Penguin feels like a penguin and acts like a penguin but he is blue. " 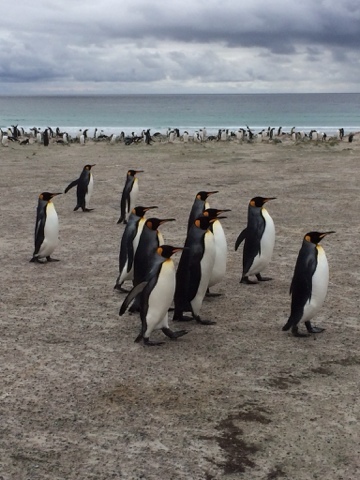 "...you're not like us" said the other penguins and they wandered away." Poor blue penguin was lonely and sad and he dreamt at night that a beautiful white whale would come and rescue him. He sang and sang, and slowly another penguin heard and came closer and closer. She begged blue penguin to teach her this beautiful song, which was so magical that it captivated the other penguins too. Finally when the whale arrived to answer the call, Penguin finally realised that he was valued and accepted and no longer needed to be rescued. He was loved for who he was. Petr's Penguins are so extremely cute and his signature use of colour is luminescent and beautifully bold. Culturebaby wanted this book again and again. It is definitely my favourite of his (many fabulous) works to date and carries a crucial message for our little people about tolerance and the value of authenticity. 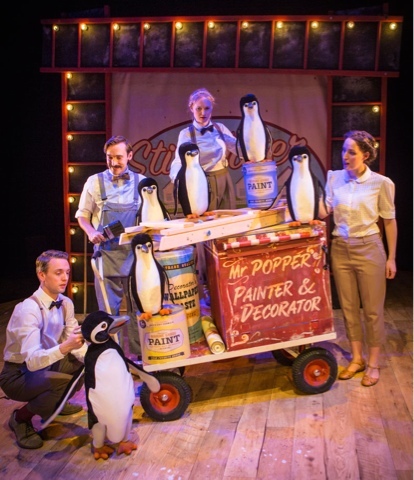 Mr Popper's Penguins is currently on tour (at the Lowry in Salford until January and then on to Kingston) - dates can be found here. Disclaimer: We were invited along to Cadogan Hall to review the new musical Mr Popper's Penguins. 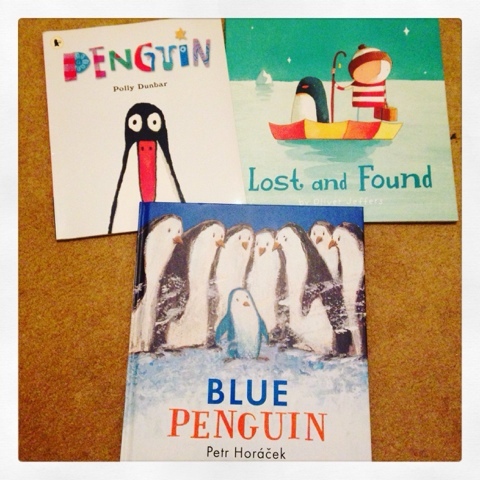 We were also given a copy of Peter Horacek's Blue Penguin by the fabulous Walker Books for review purposes. This new book was published in November. All other materials are our own.